Compaq 2710p is with a complete set of higher-end specification model. This notebook do come with the support to several operating systems namely: Genuine Windows Vista® Business, Genuine Windows® XP Tablet PC, Free DOS, Genuine Windows Vista® Business downgrade to Genuine Windows® XP Professional. The Compaq 2710p is available with, Intel® Core™ 2 Duo ULV Processor U7700 of speed 1.33 GHz, 533 MHz FSB with 2 MB of L2 cache. If you are on the search for a notebook with multiple features and good specification then, this Compaq 2710p would be the best choice. A greatest advantage of this notebook is that it has the upgradeable memory of to 4 GB maximum (2 GB SODIMM in slots 1 and 2). Here are some of the detailed specification and system features of Compaq 2710p which is with mobile Intel GM 965 chipset. To start with is the processors supported by this notebook are Intel® Core™ 2 Duo ULV Processor U7700 with a speed of 1.33 GHz and 533 MHz FSB, Intel® Core™ 2 Duo ULV Processor U7600 with a speed of 1.2 GHz, 533 MHz FSB and Intel® Core™ 2 Duo ULV Processor U7500 that has a speed of 1.06 GHz and 533 MHz. The Compaq 2710p supports various operating systems to be listed as Genuine Windows Vista® Business, Genuine Windows® XP Tablet PC, Free DOS and even do not leave the Genuine Windows Vista® Business downgrade to Genuine Windows® XP Professional. The memory capacity of Compaq 2710p is of course mind blowing to be noted on. It has 1 GB 667 MHz DDR2 SDRAM, 2 GB 667 MHz DDR2 SDRAM. These operate at a maximum of 533 MHz with 667 MHz memory. It has 2 SODIMM memory slots and one great advantage of this notebook is that it has an upgradeable 4 GB maximum memory support with 2 GB SODIMM slots 1 and 2. Next the storage capacity of Compaq 2710p could be considered as the best with its 80 GB 4200 rpm SMART PATA, 100 GB 4200 rpm SMART PATA, 64 GB Solid State Drive hard drive. So next on the list comes the audio, lots and ports specification of Compaq 2710p. it is with 2 USB ports 2.0 one1394a, one battery connector, one microphone in, one headphone/line-out and one docking connector. At the rear side of the Compaq 2710p are the following one RJ-45, RJ-11, external VGA monitor, AC power. It has a High Definition Audio support of w/24-bit DAC. One Integrated mono speaker, with integrated microphone. It also have a Touch-sensitive controls for volume up, volume down, and mute. There is a Stereo headphone/line out and Stereo microphone in. 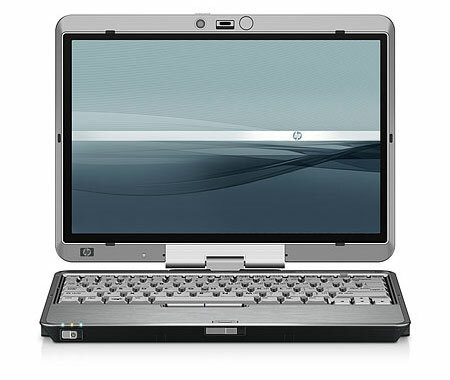 The battery of the Compaq 2710p is with 6 Cells made of high capacity Lithium-Ion. This is attached with a finger print sensor that helps in highest security to your notebook.